The goals of Farm Beginnings® and our other Farmer Programs are clear. We want to see more farmers on the land and a system in which family farms can flourish. As farmers thrive, they care for the land, strengthen their communities, generate income for themselves and others, and produce food for their region. Our role is to facilitate the training, land-access, networks, and mentoring systems throughout the start-up years. Specifically we aim to be a solid, cohesive, and clear resource for beginning farmers. Participants of Farm Beginnings® Farmer Training will be better prepared to start farming, add or change enterprises on an existing farm, approach creditors for loans, or delay farming to increase their likelihood of success. In addition, graduates of this program are more likely to find a successful land match after completion of our certified training programs, as it will prepare them with a network of support, a farm mentor, and a strategic business plan. These whole-farm skills will bolster our regional economy by increasing the success and retention rate of small-scale farmers in our region. The success of beginning farmers and the Western NC region are entwined. [After Farm Beginnings] we not only understand the importance of [setting our goals, record keeping and budgeting], but also have the tools we need to successfully and diligently keep up with our goals and achieve our dream. The connections that we have created through Farm Beginnings is what we cherish the most … We now have a network of dear friends whom we can call on if we ever have a problem, need assistance, or just simply to talk, vent, and relate. Farming is a beautiful lifestyle and we feel so lucky for all that we have everyday. But it is very hard work, and getting through it would not be the same without the amazing support system that we now are apart of. The success of our communities depend on the success of our growers. Regions across the country need an influx of farming entrepreneurs in order to sustain and grow regional food production. In the Southern Appalachians, we know that the new farmers we serve are more likely to be interested in sustainable agriculture practices and running farm operations in the small-to-mid-sized range, which is ideal for our region and very aligned with the OGS mission of promoting sustainable agriculture. These new farmers offer the promise of enlivening our economy, advancing sustainable agriculture and forestry, and bolstering access to healthy local food. The OGS Farmer Programs fill the current gaps in regional agricultural services for beginning farmers by providing comprehensive and holistic farmer training, ongoing support and mentorship, and innovative land access opportunities in the Southern Appalachians. Who benefits from farmer training? Beginning farmers face many challenges, yet thousands are being drawn to an agricultural life. Many are returning veterans, second career seekers, college graduates, and young people with no prior farming experience. OGS Farmer Programs have seen a 75% increase in demand from 2011 to 2014. Farm Beginnings® Farmer Training supports emerging, in-training, start-up, and beginning farmers who have been operating a farm business for 10 years or less. OGS Farmer Trainings serve the Southern Appalachian region including mountain regions of NC, TN, VA, GA, and SC. Our offices are located in Asheville, NC and the majority of our work is conducted in the Mountain counties of Western NC. Our programs focus on the sustainability of whole-farm operations, and are inclusive of farmers of all ages, races, genders, experience levels, and production models. In 2013, 79% of the farmers served through OGS Collaborative Regional Alliance for Farmer Training (CRAFT) were “limited resource farmers,” as defined by the USDA. Through our Barriers to Farming in WNC survey, we know that 72% of the respondents have been farming 10 years or less, 48% are under the age of 39, 80% are farming 40 acres or less and 64% are farming less than 10 acres, significantly smaller than the NC average of 168 acres (NC Agriculture Overview). All of the OGS Farmer Programs are led and directed by local farmers to give participants a direct connection to successful farmers in WNC. Our Farmer Programs Team uses the results of the “Barriers to Farming in WNC” study to strategically guide the OGS Farmer Programs and partnerships. OGS Farmer Programs are strategically guided by both a Farmer Education Committee, which is a subgroup of the OGS Board, as well as a steering committee made up of CRAFT and Apprentice Link farmers. Members of these groups are active organic/sustainable small farmers in WNC. We strive to have at least 50% of members be ‘beginning farmers’ (i.e., they have been farming for 10 years or less, based on the USDA definition). To ensure that the OGS programs are guided by farmers, these groups meet on a quarterly basis for program design, development, evaluation, and planning. Farm Beginnings farmer presenters are chosen, and cultivated from these committees and from the larger sustainable farming community. These farmer-presenters use real-life examples from their own farms in the teaching curriculum and farmer presenters are encouraged to discuss their failures as well as their successes. Instead of a theoretical approaches, students get direct farmer-to-farmer exposure and peer-to-peer education. The OGS staff are themselves farmers. Lee Warren is the founder and manager of Imani Farm in Black Mountain, Nicole DelCogliano is the co-founder, owner, and farm manager at Green Toe Ground Farm in Burnsville, NC. Cameron Farlow, is part of the Hickory Nut Gap Farm and the Lord’s Acre Farm family. 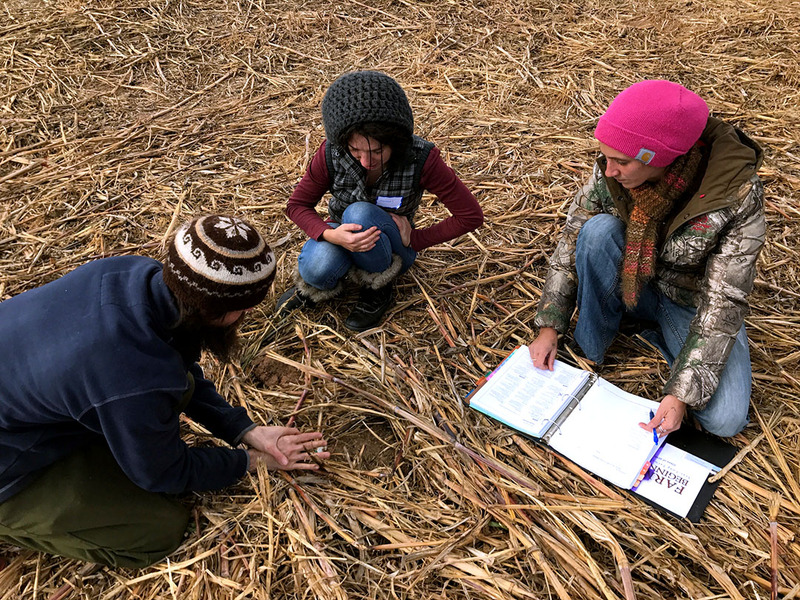 Based in Asheville, NC, and serving the southern Appalachians, Organic Growers School has been raising awareness and capacity for sustainable food and farming systems for 20 years. Becoming a member of the Farm Beginnings Collaborative and bringing farmer business training to WNC seemed like a natural step in the progression of OGS’ trajectory. In 2008, OGS created a local chapter of CRAFT (Collaborative Regional Alliance for Farmer Training) serving Western NC and Southeastern farmers. Since that time, CRAFT has supported over 700 farmers and farm workers with peer-to-peer, practical education and is active in 16 counties. CRAFT has not only graduated farmers, but also attracted more serious aspiring growers to our region, who have provided dependable labor for existing local farms. Many participants in the CRAFT program have moved on to improve established farm businesses or start new farms in the area. Organic Growers School also hosts Apprentice Link, a resource connecting farmer mentors to students wanting to learn the sustainable agriculture trade in an apprenticeship setting. Offering a structure of comprehensive, holistic, whole-farm educational opportunities for beginning farmers to plug into at multiple phases on their journey. Providing resources for equitable and affordable access to land. Participating in ongoing mentorship and networking opportunities. Providing increased regional leadership and support of farmers that results from the collective impact and synergy of the Farm Pathways Collaborative. What are the barriers to farming in WNC? Prospective farmers face many challenges, yet thousands are being drawn to an agricultural life. The number of people who want to farm or pursue careers as agriculture professionals nationwide has increased dramatically in the last several years. Many are returning veterans, second career seekers, college graduates, and young people with no prior farming experience. The OGS Farmer Programs have trained more than 600 farmers and farmers workers and saw a 75% increase in demand for training from 2011 to 2014. Farming takes courage and perseverance, dedication and time. Few who start and aspire to farm will be able to succeed without help. Fortunately, the needs of beginning farmers are emerging. Unfortunately the support systems are slow in coming. There are no programs of this scope and breadth in our region or in the Southeast. The needs of emerging, start-up, and in-training farmers are very different from the needs of seasoned farmers. Several regional organizations serve seasoned farmers in production and marketing and offer stand-alone programs and conferences. Warren Wilson College is the only institution of higher education in the WNC area to offer a Sustainable Agriculture focus. It also has a student run farm on campus and excellent curriculum but requires a four-year commitment and private college tuition. Access to Training: For generations, children of farm families have been moving away from farms, and traditional methods of farm training and transfer have been lost. Access to Capital & Support: The face of the new farmer is often young, inexperienced, and limited resource. Access to Land: While farming is an integral part of the Southern Appalachian heritage, the land in farming and the total number of farms in NC have both decreased dramatically. Since 2008 NC has lost 2,500 farms and the amount of land in farming has dropped by 100,000 acres (Krueger). Additionally, the average age of farmers in the US is 58 (Briefing on the Status of Rural America). In NC, over 70% of the farms are owned by farmers over the age of 55 and nearly two-thirds of those are over 65 (USDA 2012 COA). Typical farmland prices in WNC range from $8,000 to $30,000 per acre (Cite). Productive farmland tends to be the flat, lower-elevation properties that are most easily developed and prized by developers for subdivisions. High demand for and aggressive construction of second homes, resorts, and retirement communities force farmers to try to pay real estate development prices for farmland, pushing land out of reach for limited resource beginning farmers in particular. A Need for Regenerative Agriculture & Community: Due to rising rural poverty, world hunger, and environmental concerns, leaders from all sectors are encouraging a shift from industrial and conventional agriculture to diverse productions systems that can improve the soil, support farmers, and feed communities.